After a rainy summer kept them off the roads, Georgia motorcyclists are making up for it, enjoying rides to Ellijay, Dahlonega , Jasper and other scenic north Georgia destinations. You may have seen them flying down 400 or 575, or fueling up for the trip at your local Starbucks, and realized that many are women – and not just riders. In fact, increasing numbers of women are opting to purchase motorcycles of their own. What is responsible for the change in biker demographics? One is the increased popularity of motorbikes as a leisure activity. Even as overall motorcycle ownership decreases, it remains on the rise for the baby boomer generation. This generation of women are characterized by their independence, so their move from rider to bike driver comes naturally. Besides this, motorcycling is increasingly a social activity. Sites like meetup.com and womenridersnow.com allow bikers the ability to find and form motorcycle groups easily. Another big change is the increasing availability of women-friendly bikes and accessories. Manufacturers like Harley-Davidson, Honda, Kawasaki and Honda all sell models that are lower to the ground, with closer controls and great handling – the qualities women tend to value in a bike. And in addition, there are now plenty of options for women-friendly biker accessories. These run the gamut from helmets that are smaller sized for women’s heads to pink leather jackets. Studies suggest that women are safer motorcyclists than men. 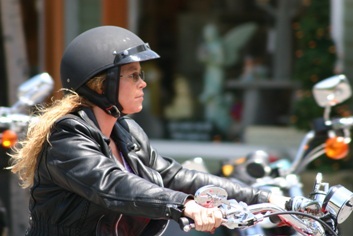 A 2008 study of motorcyclists by the Insurance Institute for Highway Safety (IHHS), found that it was safer for a woman to drive her own bike, instead of riding on the back of one driven by a man. One possible reason for this is that many women bikers complete biker safety courses, instead of learning on their own. Nonetheless, in Georgia the number of motorcycle fatalities is still quite high, with approximately 150 Georgians dying in a crash every year. If you’re involved in an accident while riding your motorcycle, and believe that someone else was at fault, you may be able to sue in order to recover medical expenses, lost wages and more. The only way to know if you have a case is to speak with a personal injury attorney who has experience in motorcycle accidents.